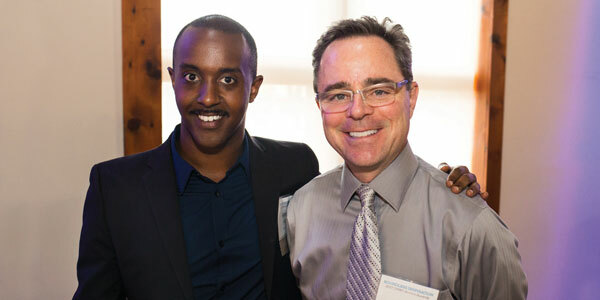 The annual UMKC Alumni Awards celebration on April 20 honored distinguished alumni while supporting the next generation of Roos. For complete bios and videos on all of the award winners, visit the UMKC Alumni website. As president and chief executive officer for the Federal Reserve Bank of Kansas City, George is a world-renowned expert on economic issues. Beyond her national leadership in shaping monetary policy, George is also known globally for her expertise. She hosts the annual Jackson Hole Economic Symposium and has participated in the Bank for International Settlements Financial Stability Institute programs in several countries. George generously lends her time to UMKC by giving presentations at the Henry W. Bloch School of Management and inviting students to visit the Federal Reserve Bank of Kansas City so they can engage with economists and other professionals. She is currently a UMKC Trustee and has served on the Bloch Advisory Council. In 2017, she was appointed to the Ewing Marion Kauffman Foundation board of trustees. She is the first woman to serve as president and chief executive officer of the Kansas City branch of the bank. Growing up in a single-parent home on public assistance, Nash worked odd jobs to help his mother make ends meet. The family bounced from house to house, forcing him to adapt to ever-changing circumstances. With the help of scholarships and loans, he earned an undergraduate degree from Wesley College and then a J.D. from UMKC. He went on to earn an M.A. in economics, an M.A. in political science and an MBA from UMKC, as well as a doctorate degree in education from St. Louis University. In 2014, Nash became the first African-American in Kansas City history to become principal and shareholder in a Top 10 commercial real estate firm. He is currently managing director and principal at Newmark Grubb Zimmer. Mentors have played a large role in Nash’s adult life — he believes the universe brings people into your life at just the right time. Nash says three people, specifically, have been outstanding mentors to him: Rosemary Lowe, Hugh Zimmer and Rep. Emanuel Cleaver II. Founder, president and CEO of the Bank of Blue Valley, Regnier has been a long-time volunteer for UMKC, dating back to his service on the Bloch Alumni Association Board from 1990-96. He has served on the School’s Finance Advisory Board and, in 2009, he and his wife, Ann, stepped into campus-wide volunteer roles as co-chairs of the university’s capital campaign, helping UMKC raise more than $250 million. In 2016, he became a member of the UMKC Foundation board of directors. In addition to Regnier’s personal service, the Regnier Family Foundation has supported the Bloch School and the university in countless ways, including founding and naming the UMKC Institute for Entrepreneurship and Innovation’s signature program, the Regnier Family Foundation’s Venture Creation Challenge. He has been in the banking profession for more than 45 years and attributes his work ethic to lessons he learned from his father. Mehari fell in love with jazz after listening to “Kind of Blue” by Miles Davis, one of the most iconic jazz records of all time. Since then, Mehari has released numerous records of his own. In March 2017, he released “Bleu,” his first album serving as band leader. These Roos met their future spouse while studying at UMKC!